What can be better after a laborious day of field work than going to a yoga class to relax and rejuvenate while taking in the final rays of light? 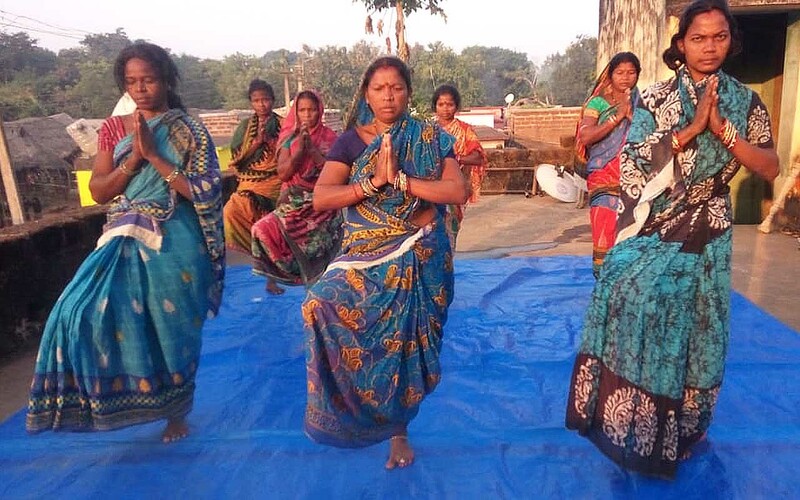 Yes, 15-20 women of Haridamada village in Odisha are gathering at health worker Sangeeta’s home for a yoga and meditation session. Together they are developing a regular practice completing Surya Namaskar and simple asanas before the sun has set. Health worker Sangeeta received the yoga instructor training in June and has evolved into a very dedicated student of yoga. She immediately started giving classes to children, and included classes for women shortly after. Actually, it is the women of Haridamada themselves who are calling Sangeeta to conduct the classes for them. And why not, Sangeeta’s classes are of very calming nature and create subtle atmosphere. The women are saying that they feel the benefits of regular practice: the relaxation, rejuvenation and ineffable peace of mind.